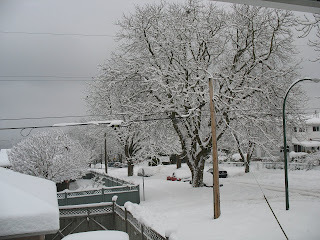 This was what conditions outside my house were like on Christmas Eve morning. (Obviously I didn't make it into work.) Today's post may be about wearing red and green, but there's nothing like a white Christmas to get you in the festive mood! Around this time of year, even those of us who live in monochromatic wardrobes year-round may yearn to wear red and green and "look festive." It's easy to do if you're going to a fancy party--after all, you can don a satiny emerald or scarlet cocktail dress and look drop-dead gorgeous. But what about a more casual get-together? That's a bit trickier as you try to avoid looking clichéd or tacky. In today's post, I'm using my own wardrobe to put together some festive casual looks that are perfect for a turkey dinner with the family, or snuggling next to that special someone in front of a roaring fire, hot cocoa in hand. Enjoy and Merry Christmas, everyone! 1. Avoid Crayola-esque red and green shades. If the red and green resemble the crayons you would get in a basic 8-colour box, chances are they'll look terrible together. Try richer shades of red like burgundy, maroon, or tomato red. For green, go with a super-bright shade like the trademark Lacoste green, or choose a more subdued mossy or emerald hue. 2. Don't be too literal with the holiday motifs. No jewelry shaped like miniature Santas, no brooches shaped like evergreen wreaths, and definitely no necklaces with tiny Christmas light bulbs on them. Instead, try accessorizing with jewelry that evokes a holiday motif in an abstract way, such as silver filigree blossoms that are shaped like poinsettias, or jeweled brooches that resemble art deco snowflakes. In the outfit below, I paired the maroon sweaterdress with my Forever 21 necklace, which has a pearl accent reminiscent of an ornate snowflake. 3. For those who like to play it safe, accessorize with red and green. This is an easy way to wear red and green for those uncomfortable with anything except head-to-toe black. My outfit below is quite simple and relies on the red headband and burgundy pumps for pizzazz. 4. Use black as a neutral instead of white. Red/white/green are rather clichéd together, while black adds mystery and sophistication. 5. Realize that plaid is rad. Tartans and plaids often incorporate red and green in the pattern; all you have to do is pair the plaid with another red or green piece that will play off the colours in the fabric. I layered a red cami under a black cardigan in the outfit below; notice how the red cami picks up the faint red lines in the green plaid skirt. Do you have any suggestions for wearing red and green in a stylish way? am enjoying this post on how to dress for xmas! Oooooooh I'm loving your banner sooo much!! I'm going to a beautiful place, Michoacán. I love all the outfits. That dress is gorgeous on you. You look absolutely gorgeous in each of the pictures! awesome suggestions! yeah i never wear red and green together - but that's b/c i don't own anything in those colours except for shoes...i would totally do the accessories though! i love the third the best :) great ideas! hope you had a lovely christmas! Adorable outfits. I don't think I've ever managed to pull off red & green together since the few items I own in those shades are very bright & primary colored. Happy holidays & hope you're not too snow bound! All great looks but I especially love the last one. Good tips. Red and green can be so striking. Love this advice and your chic looks, Lisa! Hope you are having a fab holiday season, beauty! Great post, there's many people that have that holiday spirit and splash the two colors together without thinking much. Hope you have a great new year! Btw, my blog's address has moved to http://www.fashionaddictgirl.com so if you have the time could you please change the link on your blog roll? Thanks! Thanks for all the compliments and holiday wishes, everyone! Dana, thanks for the compliment on the banner! I hope you enjoy Michoacan. My favorite is the last one. I really, really love that skirt! I often wear green jeans, but they're rather muted... problem is, I usually wear a bright red peacoat. I'm sure it looks rather tacky, but I don't even care anymore. If you wear it with confidence, you'll look great. That's my motto!